Shona Macdonald’s work, for the past fifteen years, has been determined by place. She responds to whatever environment in which she finds herself. Currently she lives and works in New England, a place that for landscape painters has long figured into the notion of a pastoral ideal. Her understanding of pastoral is any expansive green space that offers a respite from the built environment, a sanctuary. Her current work investigates the conflict between ‘natural’ and ‘cultural’ landscape. By this, she means that the ‘ideal’ of the pastoral has gone unchallenged yet continues to shape the human relationship to the landscape. She perceives that the pastoral, (or nature) is still idealized in this country, particularly in New England, because it represents a place in which to escape. The paintings in Sky on Ground attempt to counter this ideal by representing the landscape as an uneasy, mysterious, and unpredictable place. 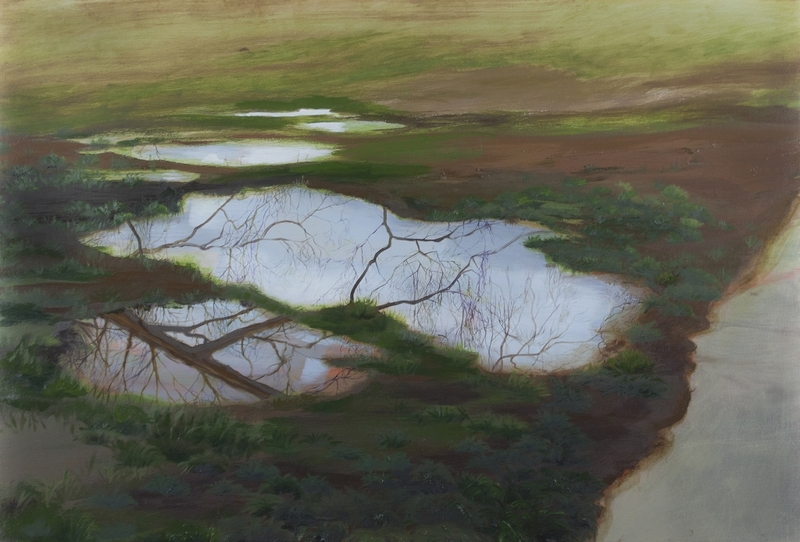 The work acknowledges that reflections in water are a significant part of the history of painting yet rather than depict reflections as places that evoke elevated or sublime emotional states, she focuses attention on the puddle as a melancholic after effect. These works reflect (literally and metaphorically) upon the environment. She offers a poetic space, such as a puddle, to gaze into. Puddles, and their attendant reflected images, shrink and disappear, hinting at our transient and fragile hold on the earth. At the heart of this work there is an uncanny ‘doubling’ embedded in the use of reflections that she purposefully employs to exaggerate a sense of dislocation and displacement as people move throughout the world. About the artist: Shona Macdonald received her M.F.A. in 1996 in studio arts from the University of Illinois at Chicago and her B.F.A. in 1992 from Glasgow School of Art in Scotland. She has had selected solo shows at the Tarble Arts Center, Charleston, IL, (2015), Gridspace, Brooklyn, NY, (2014), Ebersmoore, Chicago, (2012), the Roswell Art Museum, Roswell, NM, (2011), Engine Room, Wellington, New Zealand, (2010), Proof Gallery, Boston, MA (2009), Reeves Contemporary, NY, NY (2008), Den Contemporary, LA, CA, (2007), Skestos-Gabriele, Chicago IL, (2005), Galerie Refugium, Berlin, Germany, (2002), and Fassbender Gallery, Chicago (1998 and 2000). Her work has been included in numerous group shows across the United States, UK, Australia, and Canada. Reviews of her work are included in Art in America, Art News, the LA Times, Chicago Tribune, Chicago Sun Times, Sacramento Bee, Boston Globe, Artscope, and New American Paintings. She has been a Visiting Artist at over forty institutions, including Wimbledon College of Art, London, (1998), Georgia State University, Atlanta, (2007), Cornell University (2006), the University of Alberta, and the University of Calgary, Canada, (2002). Shona Macdonald was the recipient of a grant from the Pollock-Krasner Foundation, NY, (2009), a Fellow at Roswell Artist-in-Residence in Roswell, New Mexico, (2010-11), Can Serrat, Barcelona, Spain, (2012), the Cromarty Arts Trust in Scotland and will be resident at Ballinglen in Ireland, summer of 2017. She is currently Professor of Studio Art and Graduate Program Director at the University of Massachusetts Amherst and formerly Associate Professor at Illinois State University, where she taught from 1998 until 2006.